The use of half guard and all of its variations is all the rage right now. More and more jiu jitsu practitioners are following the lead of Roberto “Gordo” Correa who was the first well-known competitor who began to popularize the half guard position in the 90’s. What had been thought of as a last ditch ‘Hail Mary’ to prevent the guard pass, began being utilized and developed as a position in and of itself. The irony is that Gordo’s entire use of the position began because of a knee injury that prevented him from playing other types of guard. Flash forward and there are a number of high level practitioners who make use of half guard extremely effectively and have developed an entire catalogue of techniques from variations of the position itself to many sweeps and submissions. People like Jeff Glover, Bernardo Faria, Tom DeBlass and Craig Jones are some of the biggest names in the sport and they all have unique and powerful systems of half guard they utilize in their matches. Today hundreds of thousands of jiu jitsu students around the globe are using their knee shields, bottom hook, frames and under hook to withstand tons upon tons of opponent pressure, elevate them to sweep them, reverse them and attack or perhaps to set up a Tom DeBlass style attack from bottom half guard. With the resources available now it’s the perfect time to overhaul the half guard you’ve been working or to add it to your arsenal. Or maybe they’re a student of the Craig Jones’ style Z guard with its dynamic and painful knee shield and hip clamp. Because of the recent explosion in popularity of the half guard, there must also be an explosion of new ideas of how to defeat it. In the video below, Tom DeBlass offers a pressure passing style solution to the dreaded Z Guard in the Gi. Yes, Tom DeBlass wears a Gi quite frequently, so don’t be shocked. 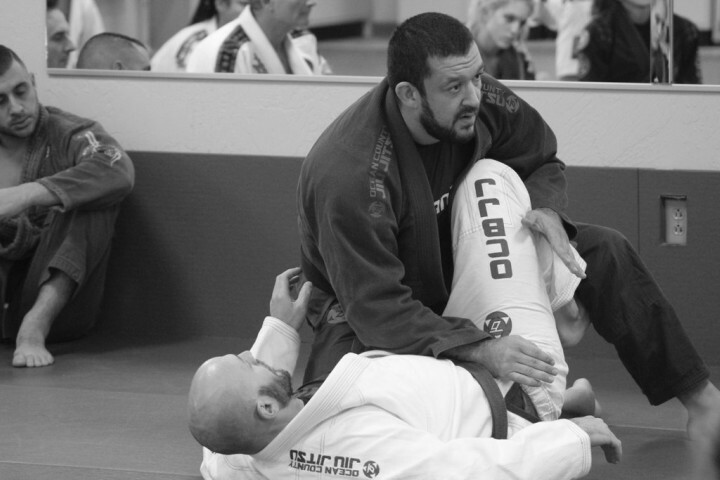 And as he has shown in all of this technique videos and at his countless seminars that tend to focus on half guard, his techniques can easy transition to the Gi. Check it out below and then we’ll break it down. Let’s look at some Tom DeBlass key points and concepts that come into play throughout his game. Understanding these will shave miles off the average person’s learning curve and have you savagely passing guards with a smile very soon! Tom DeBlass is a student of the Renzo Gracie lineage as a black belt under Ricardo Almeida, Renzo’s first black belt. As unparalleled as this pedigree is, you must keep in mind that he is the instructor and key training partners for people like Garry Tonon and Gordon Ryan. And unlike a lot of high level competitors, he forces himself to continue learning under the tutelage of John Danaher. All this to say, that his style is a perfect distillation of both old school and new school jiu jitsu. For this reason, one of the golden rules of any interaction with the opponent for DeBlass, must start with the establishing of inside control. In this case, in the opponent’s half guard/Z guard, Tom does this by bringing his knee up underneath the shield. Splitting the legs and dominating the inside position opens up everything from simply flattening the opponent to even more complex leg attacks. Any time that Tom is passing the guard, it is important to not stay parallel to the opponent’s body. This makes it easy for them to adjust, get their hips under your hips, and possibly get your head above their head, all huge faux pas in DeBlass’ word. Instead whenever possible, ensure that your body and the force of your pressure is directed at an angle, essentially T-ing your body and power into them. In the case of this Z Guard Smash pass, utilizing the arm to base and T the body into the knee shield, while simultaneously pulling up on the opponent’s sleeve ensures that the shield becomes ineffective and the opponent is unable to turn in and to their knees to launch an offensive adjustment. As a 36 year old grappler at the peak of his career, DeBlass has seen more wars and injuries than most of us will ever see. Tom’s body, specifically his joints have paid a heavy price for the nearly 20 years of grappling and 11 professional MMA bouts. Because of this, he is extra protective of those areas and is convinced you should be to in order to prolong your BJJ career and make sure you make it to be an older grappler. This notion of being protective is something we’ve discussed at BJJ Fanatics in the past. It is crucial to be efficient and ensure that we are safely executing these positions. In the completion of this technique he makes it abundantly clear that you should never be in a position where your knees or joints are compromised if you are doing the technique correctly. Nothing the opponent can do during the pass should put your knees or anything else in harms way. As any position comes into favor, once you’ve begun to get a better understand one aspect of it, you’ve got to begin working on the counters to it. Knowing how to implement a position gives us a good foundation for understanding how to stop someone else from implementing it on us.